To advance, promote and encourage generally, the study, practice and performance of the art of music to the highest standard. The Choir was formed in 1977 by a group of musically inclined enthusiasts. It got off to a fine start and not surprisingly, it was but a short time before the local townsfolk asked to hear them in concert. Since then, their repertoire has grown and their reputation has spread throughout the county and beyond. Within a year of the Choir’s inception they were invited to participate in a BBC Radio Carlisle recording at Penrith, an LP was released by the BBC of highlights of this concert, entitled ‘Happening at St Andrews’. The choir’s greatest delight is to let their enthusiasm and love of singing well over for the enjoyment of others. Virtually all their concerts are performed for one charitable organisation or another and many thousands of pounds have been raised in this manner. An exception, however, is a performance given to a Whitehaven audience every year, designed to raise funds for themselves, as in common with other organisations, the Choir needs finances to stay alive.This event is always a prestigious affair, including a guest artist of some repute and is performed in the Whitehaven Civic Hall in the presence of the Civic dignitaries. Over the years the guest artists have included Joan Rodgers, The California Girls Choir, Jane Harrison, Ida-Maria Turri, Patricia Pictor and the Tyneside Ladies Barbershop Harmony Chorus, they have had three Radio and Television Stars perform with them, Maryetta and Vernon Midgley with Britain’s top Pianist Keith Swallow, Maryetta has had the privilege to appear before the Royal Family. Recently their guests have been Charles Ngandwe (winner of ITV’s ‘Stars In Their Eyes’), Donna Bateman, Ros Evans, Dewi Wyn, Kate Woolveridge, Owen Webb, Joanne Thomas and Louise Innes. The Choir are also very fortunate in having a wealth of local female soloists whom we invite to sing with us in our charity concerts. Another memorable date in the Choir’s calendar is their ‘Christmas Celebration Concert’ you really have to be there to experience the magic of this occasion. At present the Choir can boast of being around forty strong, the members come from all parts of the county, and one of the Choir’s ambitions is to increase their membership, so enabling them to have many more years of producing one of the worlds greatest sounds, ‘A Male Voice Choir Sound’. The Choir have a wide and varied musical repertoire incorporating many traditional Male Voice compositions, Grand Opera, Light Opera, Religious and Semi-Religious items, Spirituals, Songs From The Shows, Folk Songs, Modern Pop songs plus some downright comical and frivolous pieces. The Choir have a very active supporters club, their wives families and friends, who do so much in the way of arranging social events. It really is one big family. During the Male Voice Choir’s existence it has taken part in many north of England music festivals and has proven its expertise by winning many first prizes.In 1992 and 1993 the Choir joined the World Choir to sing a performance in the hallowed ‘Arms Park’ in Cardiff. To hear, from the home of Welsh rugby, eight thousand male voices brought together by no less a person than the international conductor Owain Arwel Hughes, was absolutely electrifying. 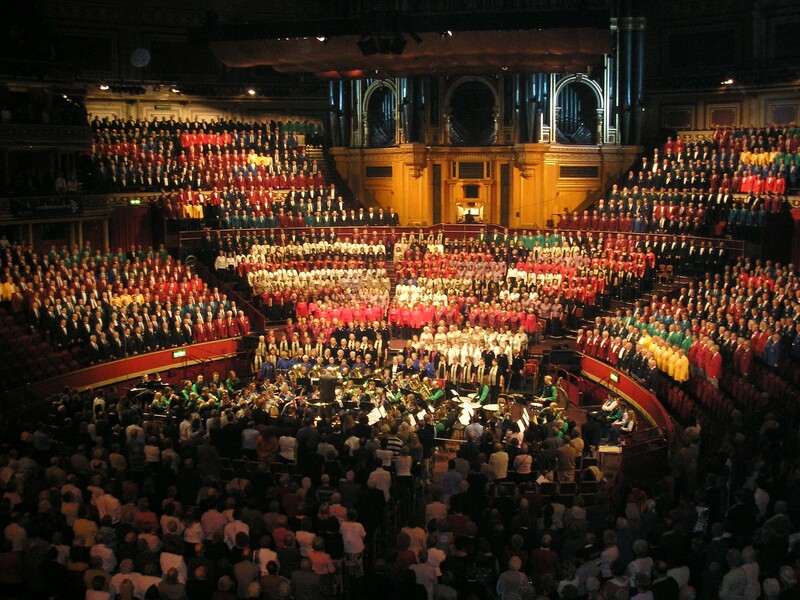 Then in 1997 the Choir had the privilege to join with the Yorkshire Male Voice Choirs to sing in the Yorkshire Festival of Music at The Royal Albert Hall in London and in the year 2000 sang in Sheffield Arena and in 2003, 2006 and 2009 once again in the Royal Albert Hall with the same choirs, truly memorable occasions. All raised many hundreds of thousands of pounds for charity. In November 1992 the Choir had the honour of organising and hosting the very first Cumbria Mass Male Voice Choir Concert, when around two hundred choristers under the director of music Norman Williams, filled the Whitehaven Sports Centre with a truly magical Male Voice Choir Sound. This event was repeated on Saturday 30th of September 2000 to celebrate the Millennium when the Choir received a grant from ‘Awards For All’ to assist with the cost of hosting the concert. Donna Bateman and Keith Swallow were the guest artists on this occasion. 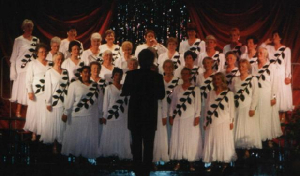 In 1996 thanks to a grant from The Sports and Arts Council, the Choir were able to purchase new aqua green uniforms. The year 2002 was the Choir’s silver jubilee year and they produced their first Compact Disc, entitled ’25 Years of Song’ recorded and produced by Priory Records, one of the country’s leading choral recording companies. The CD was launched in February 2003. 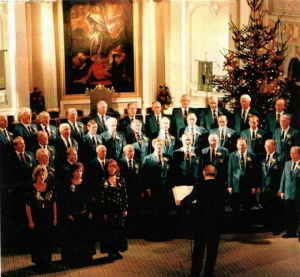 In 2004 the Choir made their first mini tour to Scotland and performed in Palmerston Place Church in Edinburgh. The year 2005 was very successful for the Choir, when once again they hosted their third Cumbria Mass Male Voice Choir Concert in Whitehaven Sports Centre on 24th September, two hundred choristers took part from six Male Voice Choirs from throughout the North of England. The concert was conducted by Doris Williams and the president of the National Association of Choirs Mr Eric Jackson was present. They also joined in the celebrations of the 200th anniversary of Trafalgar with a concert on 21st October hosted by the Whitehaven Sea Cadets. The year 2006 was just as exciting, with the Choir performing in over twenty concerts throughout Cumbria. These included celebrations of the 300th anniversary of the Benedictine Mission in Whitehaven & West Cumbria, a concert at the prestigious Theatre By the Lake in Keswick, and just to put the icing on the cake, in November we once again sang in the Royal Albert Hall, raising £95,000 for Cancer Research UK. During 2006 the Choir raised nearly £10,000 for local charities! Highlights of the Choir’s ’30th Anniversary Year’ – 2007, were the Annual Concert in June, the 30th Anniversary celebration event in September, the hugely popular ’30 Year History Exhibition’ which ran for six weeks at one of Whitehaven’s premier tourist attractions, The Beacon; and the sell out Christmas Celebration Concert. In 2007 the Choir participated in nineteen events helping to raise over £6000 for charity. 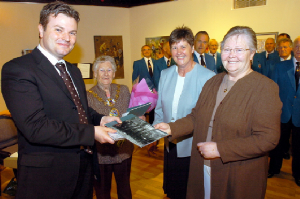 Above: Copeland MP Jamie Reed and Mayor Councillor Willis Metherell were presented with a copy of Whitehaven Miners’ Male Voice Choir tour diary and photograph at the Choir’s 30 year history exhibition opening ceremony. They were presented by Sue Raine (2nd from right) exhibition co-organiser and Joan Woodend (far right) Choir Historian and exhibition co-organiser. The Choir’s Website & Publicity Manager Graeme Wishart was also an exhibition co-organiser. The Choir completed another highly successful year in 2008. They performed at nineteen concerts/events raising £6,742 for various local and national charities and other worthy causes. The choir’s highlight of the year was performing in front of HRH The Queen and Prince Phillip during their visit to Whitehaven in June. With an ever increasing membership, currently standing at forty-three, the choir can look forward to the prospect of many more years of song. On January 8th 2009 the choir welcomed back their Musical Director Hugh Robinson following his recovery from illness. The choir are extremely grateful to David Proud who directed them for the majority of 2008. In 2009 the choir had another full concert diary, and greatly enjoyed travelling to The North East in April as guests of The Gibside Singers at their Annual Concert. The brilliant ladies choir, under the direction of Doris Williams, appeared as our Annual Concert guests at Whitehaven in June to a sell out audience. October also saw our choir’s fourth visit to sing in The Royal Albert Hall, London as part of The Festival of Brass and Voices; raising much needed funds for Cancer Research UK. The choir had another successful year in 2010 with many concerts and events. March saw a return visit from The Gibside Singers as guests of The Mayor of Copeland, who performed alongside ourselves in his Charity Concert. And in June soprano Rhian Lewis was our Annual Concert guest. Sadly, in October, our long serving Musical Director Hugh Robinson passed away, following a long illness. 2011 was another very busy choir year, performing in twenty-five concerts and events, and raising nearly £11,000 for charity. Wonderful Irish classical crossover soprano Margaret Keys graced the town’s Civic Hall stage in June for a sell-out Annual Concert. And in December, the Christmas concert and singing in local supermarkets raised £2600 for our charity of the year Hospice at Home West Cumbria. 2012 saw the choir performing in seventeen charitable concerts and events, raising over £5500 for worthy causes, with very successful Annual Summer and Christmas Concerts. In June they also welcomed a very accomplished musician, Peter Argyle as their new Musical Director. 2013/2014 have also been very busy for the choir, with many concerts and events being performed, and thousands of pounds again raised for charity. The choir were delighted to welcome the wonderful Irish soprano Margaret Keys back to Whitehaven for their 2014 Annual Concert. They also completed a very successful trip to Scotland where they performed at Kinlochard and were honoured to perform an afternoon concert in the beautiful setting of Stirling Castle chapel. In 2015 the Choir performed in nineteen concerts and events raising £6366.36 for local charities, during another busy year which saw them perform in a massed choral event as guests of K-Shoes Male Voice Choir in Kendal and the recording of their second CD. 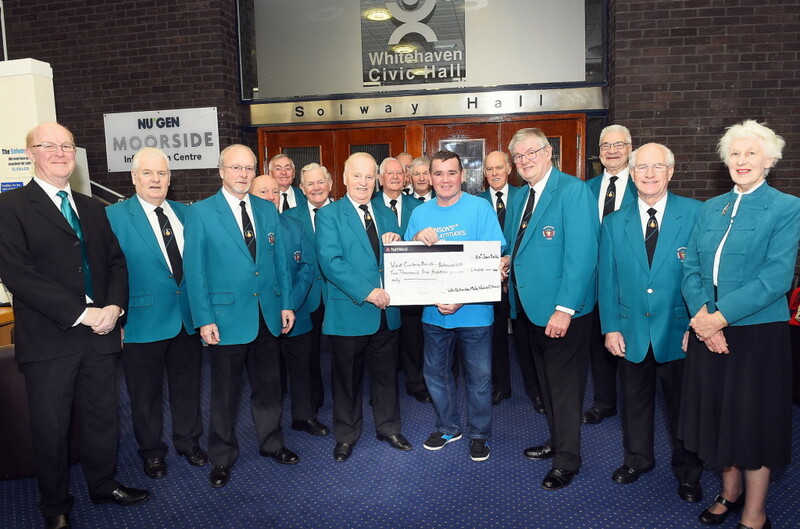 In January 2016, the choir presented a cheque for £2600 to John Kane of the west Cumbria branch of Parkinson’s UK. The money was from proceeds of the choir’s Christmas concert and carol singing in local supermarkets. Photo courtesy of The Whitehaven News.